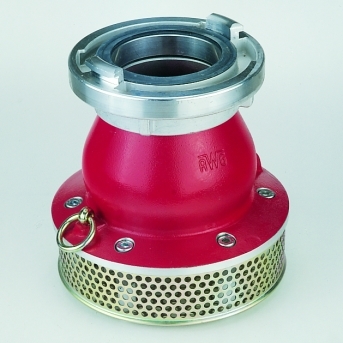 Available are suction strainers with and without non-return valve and drain arrangement. We recommend generally suction strainers with non-return valve and drain arrangement in order to prevent discontinuities in the liquid column when the suction process is interrupted and makes it possible to fill the suction pipe run. Pulling the rope of the drain arrangement causes the check valve to open and to drain the suction hose.